Our guest are provided with ample parking in our front or rear lot. Appointments before 5pm are welcome to park in the front of the center, however for the safety of clients with evening appointments are asked to park in the rear at the far end door entrance. For the first trimester, you should avoid Massage Therapy. If the mother is having any complications it is recommended that you avoid massage unless specifically prescribed by a doctor. Your privacy will always be respected. 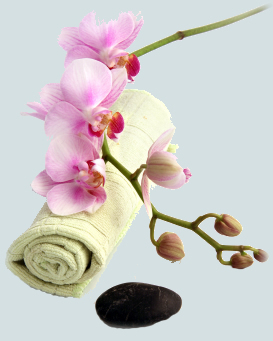 You will be fully draped or covered during all treatments. We highly recommend making reservations in advance, however, feel free to call on short notice, as we may have an opening or cancellation. A credit card will be necessary to hold your reservation. Our receptionist will provide a complimentary call reminder for your appointment. We also recommend that you book future appointments at checkout to ensure your choice of date and time. At times it is necessary to cancel or change an appointment. Please notify us 24 - 48 hours in advance so we may have enough time to fill the slot with another guest. “No shows” and late cancellations (less than 24 hours) will be charged 100% of the service fees as our therapists must still be compensated for their time. Time is the core of our business, so mutual respect is asked to keep the value of our services and your time proportionate. Please arrive a minimum of 15 minutes prior to your first service appointment to allow yourself time to check-in. Please silence all cell phones and pagers. To ensure the ultimate experience for yourself and other guests, please refrain from bringing children. A quiet environment is necessary in providing a true relaxing experience for our guests. It is your responsibility to keep up with your gift certificate. Expiration dates also apply to lost gift cards. Our accurate system keeps up with whom the gift certificate belongs therefore, if someone else attempts to use the certificate the actual recipient must notify us before any appointment is made.